Published in Rafu Shimpo, July 9, 1955. 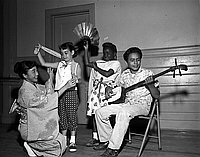 Azuma Harunobu teaches odori, or Japanese dance, to school children ages seven to twelve years-old at Friendship Day camp at Griffith Park in Los Angeles, California, July 6, 1955. Japanese woman in kimono shows group of children how to dance in gym. Typed on original negative envelope: Friendship Day Program -- Azuma Harunobu. Azuma Harunobu, shamisen artiest, was a special guest at the daily musical session at the Friendship Day camp in Griffith Park.